According to a new report by the Irish Times, newly-discovered historical documents reveal that Ireland’s embassy in Moscow began sourcing its food from Finland in the wake of the 1986 Chernobyl radiation leak. 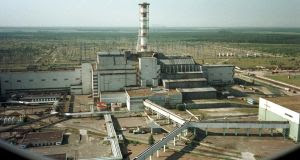 The disaster, which occurred in Ukraine on 26 April 1986, saw a meltdown of the Chernobyl nuclear power station’s radioactive core, caused by a combination of design flaws and human error. Deadly radioactive fallout spewing from the exploded reactor was carried by the wind across a huge area. Contaminants have been detected all over the world; and the event remains the world’s largest ever nuclear accident. As such, food safety fears are hardly an over-reaction. Indeed, it’s through contaminated food and water that such pollutants are most likely to cause harm to the body. Such is especially true when it comes to the most dangerous ionising particles, which may struggle to breach thick surfaces like skin but which can easily penetrate the thinner flesh of the human digestive tract. In the immediate aftermath of the disaster, the British government also introduced controls, albeit upon sheep farming in certain areas of its own jurisdiction, fearing the risk posed by winds carrying radioactive fallout to upland areas of the UK. According to the Food Standards Agency, ‘emergency orders were used to impose restrictions on the movement and sale of sheep exceeding the limit [of 1,000 Bq/kg of radiocaesium], in certain parts of Cumbria in north-west England, North Wales, Scotland and Northern Ireland.’ It took until the 1 June 2012 for the last of these controls to finally be lifted. Closer to the disaster zone, however, many areas are still sealed-off for public health reasons. The documents discovered by the Irish Times reveal that, after finding high levels of radiation in the premises of the Moscow embassy, Tadhg O’Sullivan, Irish ambassador to Moscow at the time, concluded that it would be more diplomatic to keep the Irish embassy staff’s new food sourcing a secret from their Soviet hosts. Such might also partly explain the Irish embassy’s cautious approach before local authorities regarding food sourcing: it’s likely that little good would have come of telling the Soviets they were importing beef from Ireland and other foods from Helsinki, after all. Still, the news does at least remind us of the potential woes of poor governance during times in which state-led responses to public health crises are desperately needed yet inadequately realised.